Multipurpose widget called KeyHole displaying maps and the weather. This is probably the longest title I’d ever create for a blog entry. To see a sneak preview of Hendrik Ebbers’ implementation of a Roku-AppleTV-like application container check out his blog entryhere: http://www.guigarage.com/2013/08/boxfx-javaone-preview-1/ The application container is called BoxFX. In this blog entry I will discuss some high level concepts relating to the frameworkeWidgetFX and the application container TrayFX. Since there is a lot to digest I would like to at least (briefly) show you each layer in the architecture. Disclaimer: BoxFX and TrayFX are currently private APIs. Both approaches have similarities, however they are independent projects. It’s important to hear from the audience for potential use cases. They eventually will wind up as open source projects. Also, leading up to the JavaOne talk some diagrams or APIs are subject to change in this blog entry. Core widget framework API that widgets and widget containers depend on. The APIs provide services for loading widgets, widget life cycles, and utilities for the widget developer. The main idea was to provide a cross platform application API for application container developers and widget developers to coexist. In fact the goal was to have cross platform widgets & apps capable of running on any app container (based on the eWidgetFX lib). 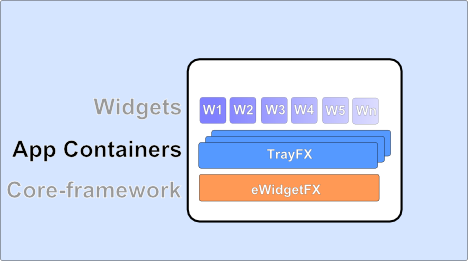 TrayFX is an App Container instance that depends on the core widget framework (eWidgetFX). Shown below is the middle layer which is basically different custom application containers based on the core. Application Containers depend on the eWidgetFX API (core). This allows developers to build their own custom application containers. 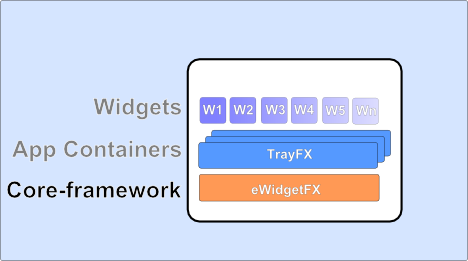 TrayFX is an App Container instance that depends on the core widget framework (eWidgetFX). This means that you to can develop your own JavaFX widget & app container of your liking if you don’t like TrayFX For instance you could create one for a tablet device which may have different UI metaphors and varied screen sizes (real estate). Shown below is TrayFX launching a clock widget (on the Desktop). Widgets are mini-applications that can launch standalone or launch inside a widget container such as TrayFX. Widget’s Class Diagram using the eWidgetFX core library. In the JavaOne BoF (BOF2605) since the framework is still very alpha during the talk we will present a possible developer workflow to create, build, deploy, and launch widgets. Below I would like to share a small bit of code to give you an idea of how easy it is to implement a widget on the eWidgetFX platform. Usually, application launching frameworks have life cycles for the application containers to manage widgets & apps. Widget developers will not need to implement aStage nor a Scene and basically focus on what they know best (their JavaFX widget as a Node). The framework APIs will allow you to interact with the JavaFX parent containers such as Stage and Scene. The eWidgetFX Widget interface is shown below which has methods that a widget developer would need to implement. For brevity please look at the comments on the methods to understand the basic widget life cycle. * Returns a created WidgetIcon for the app container to use. Called 1st. * @return WidgetIcon containing a raw node representing the icon. App containers can resize. * Called after buildWidgetIcon() method to allow background processes to occur. Called 2nd. * an email widget periodically checking email to update Icon overlay the number of emails received. * Initialize the widget. If the developer calls this method the framework will not call it. Called 3rd. * Start is meant to be called when the user clicks the icon to launch widget. Called 4th. * Pause is typically used to pause animations. Or other developer defined resources. * Resume is typically used to resume a animations. Or other developer defined resources. * Stop is called when the widget is closed and not visible. Typically this is to stop animations, and minor cleanup. * The framework will call stop and stopBackground() method when exiting the app container. * Stops any background processes. Called when widget is being closed by the framework when exiting app contain. Called last. While building this framework we kept coming up with more features and ideas, however with very little time left we still were able to provide common capabilities that you’ve grown to love on your device. Hopefully, this will whet your appetite before you attend the BoF at JavaOne.